The Chubat Valley is a main artery of the traffic, and much of the wool from the cordillera passes over this route to Trelaw or on to the coast. The first time I saw the Chubut Valley. my party and I had been wandering and working in central Patagonia for seven months. Work done, we turned northward with relief, but so deadened by the wind, harsh living conditions, hard work, and a repugnant environment that we could not really visualize anything else or believe that release was near. From Comodoro Rivadavia, the largest town of Patagonia but a desolate, treeless, corrugated iron place, we traveled for three days. Constant mishaps delayed us, but we were used to them. An Unbelievable Valley On the third day, toward sunset, we were driving across the nearly flat and wholly drab pampa beneath flame-colored, wind shredded clouds. In the last hundred miles we had passed just one house, a small square box of mud and tin. Everywhere else were pebbles and thorn bushes, with only an occasional guanaco or hare to give life to this monotonous and desert plain. Unexpectedly we came to a jumping-off place, sudden cliffs and steep slopes down to a flat-bottomed valley. Straight ahead in the valley was a spot that represented the Territorial Capital, Rawson, and somewhat nearer, to the left, was a more distinct cluster of houses beneath two tall radio towers, the town of Trelew, metropolis of the oasis. We went down into the valley, and life became a strange dream. We seemed to be driving along a country lane, between rows of green trees, and over rustic bridges across placid canals and streams. We seemed to pass farm houses and green fields and to see cows wandering homeward to be milked, escorted by white and blonde children. Surely it could not be real! Since that memorable moment, I have spent some time in the valley, in most of its various small settlements, and have traveled along the better part of the river course, from Trelew to Paso de los Indies. I have learned that even the valley has its barren and truly Patagonian stretches and that the best of it is not the paradise it seemed on first sight, but the exhilaration of that first shock will always make it stand out in memory. On that first visit we stayed only two nights in Trelew, but somewhat more than two years later we were there again, and became better acquainted. This time we came in from the north, or northwest, and although we were only beginning our work instead of ending it as before, the valley was almost equally welcome. We had been traveling for three weeks, as steadily as circumstances permitted, and we had had lots of luck, all very bad: few or no fossils, which we had hoped to find, continual breakdowns, a nearly tragic slip-up in financial arrangements, illness. Such is still the common lot of the traveler in Patagonia, and we had been far off the beaten path, such “beaten paths” as there are. In one place where motor car never went before and never should again, after mishaps that exhausted our supplies, we came gently to rest with a broken crank-case in a howling wilderness of jagged lava blocks, and stayed there, foodless and waterless, until a repair was effected with some household cement and an old shirt. The Chubut Valley looked good to us then, too. Metropolis Trelew is wonderful only when seen in its vast setting. It looks like most Argentine country towns, but this conformity is itself a triumph and almost unique in Patagonia, The straight streets, laid out at right angles, are wide, and some of them are lined with small plane trees, not flourishing but accomplishing the miracle of survival. The avenue from the railroad station is a boulevard for two blocks, with a coarse grass plot in the center. Most of the buildings are stucco, one story high except for the national bank and the main hotel, which rise in grandeur above the flat town. There is a plaza, ragged but green in summer. There are good stores and large corrugated iron warehouses. There is a Colegio National, national high school, which enjoys a reputation as one of the best educational institutions in the country. There is a private school where instruction is in English and which struggles to keep the children of British and American settlers throughout Patagonia from forgetting their ancestral tongue. There is a three-story hotel with running cold and (for a trifling extra fee) hot water. A catalogue of the wonders of the metropolis would be endless. New York is not as remarkable in its environment as Trelew is in its. A Patagonian Wales Rawson, Trelew, Gaiman, and Dolavon are strange names for Argentine towns. Then there is the place, farther up the river, which the natives call Blahk Ay-zheh, and which is spelled Black Eye. And around Trelew are places with such names as Bryn Gwyn, Drafa Dulog, and Bryn Crwn. The oasis is partly inhabited, and was indeed largely created, by people of Welsh descent. 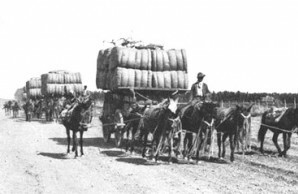 About 1865 a group of Welsh people, dissatisfied with economic conditions and (it is said) nursing a hearty grudge against their neighbors and masters the English, emigrated to the Argentine and were given the Chubut Valley to live in, generosity somewhat tempered by the fact that the valley was then barren and generally considered worthless.